We drove yesterday where others walked long ago. The drive from the visitor center at Mesa Verde to the Cliff Palace where we went on an hour long tour took a long while, maybe 30 minutes up an incline. 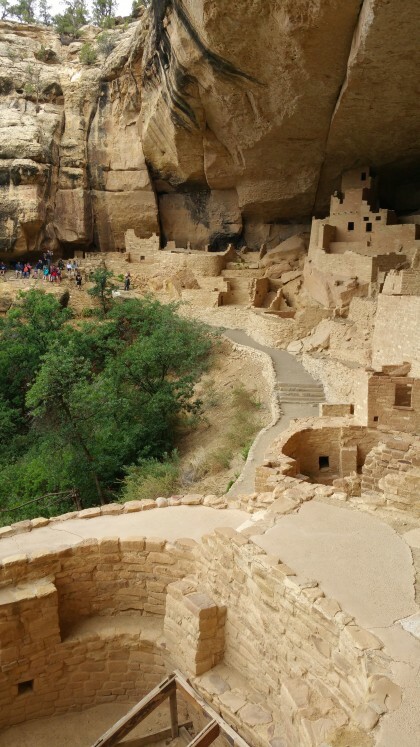 The land at Mesa Verde slopes up at an angle with fingers of land separated by eroded valleys. At the end of these wide fingers the land slopes down again, gently. 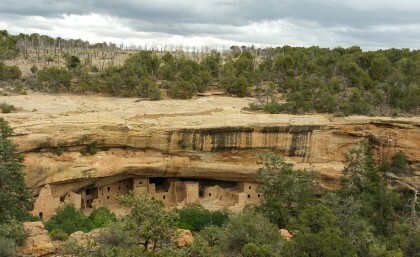 As a result, according to an exhibit at the Spruce Tree dwelling museum, Mesa Verde is not a mesa at all, but a cuesta. Mesa’s have sharp cliffs while cuesta’s slope, as they do here, toward the lower ground. The route down to Cliff Palace (I’ll post pictures when I get back home) was the same one the cliff dwellers used, narrow steps cut into sandstone, augmented a bit by the occasional iron railing. There was, too, a ten foot ladder on the way down and two ten foot ladders on the way out which also followed a cliff dweller path. It would have been a fun place to grow up as a kid, scrambling up and down over rock and ladders, a more or less level surface above the home site where games could be played. 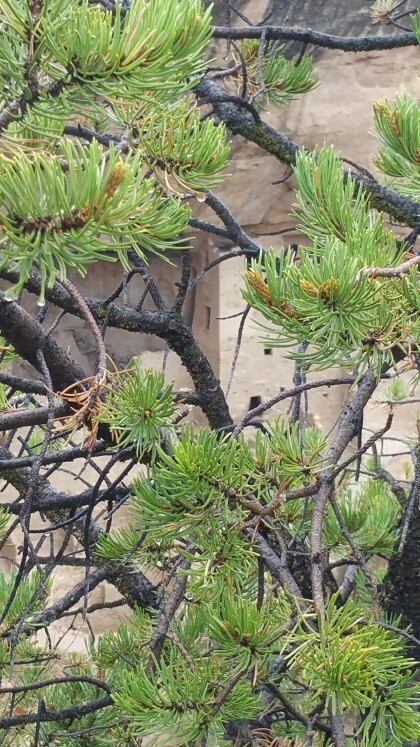 As at many sites where rock was a primary building material, the skill level was high with walls that were plumb, right angles, and a mortar that both bound the rock together and allowed water to seep through without loosening. Mark asked an interesting question about wall coverings. These rocky appearing structures would have had several coats of plaster on them and would have been painted. That means they would have looked much different than they do now. “San Juan Basin Public Health said water samples taken throughout the Animas River indicate there’s no risk to human or environmental health from normal use of the waterway. I slept last night with the patio door open, screen closed. I could hear the Animas, the river of souls, running. When I woke up this morning, it was raining. My ear was eager for the sound, found it soothing, familiar in a humid East, Midwestern way. 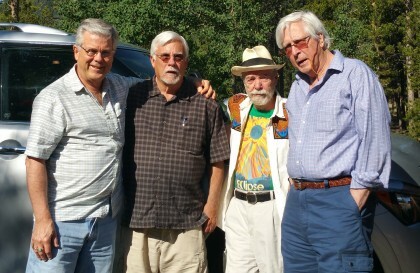 Being with Tom, Paul, and Mark has reminded us all of the depth our long time relationships has nurtured. We move together through the day easily, listening to each other, making decisions, continuing lines of thought, sparking new ones. One of Paul’s hopes is that this trip might encourage us to use a meeting app like Zoom to get together even while far apart physically. I’d like that and hope we can make it work, too. Kate says the stump grinder got a lot done in 2 hours. I’m excited to see it. An outdoor room. Later we’ll have him back to do the front, leaving widely spaced trees with no stumps.